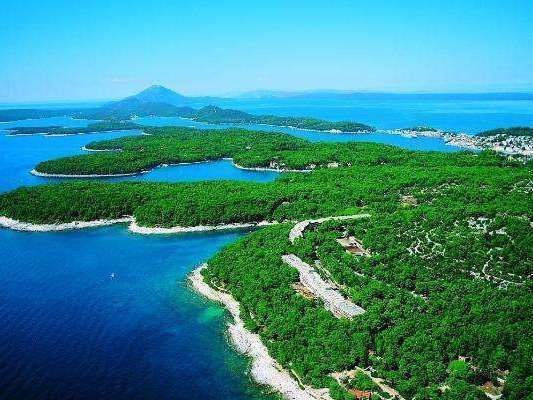 Accommodation in Veli Losinj ! All events in place Veli Losinj ! Surface : 36 m2 (Ground floor). No. bedrooms: 0, No. of bathrooms: 1. Characteristics: With terrace, in silence, with garden. Other options: Internet connection, Boat anchoring is possible, One pet is allowed. Price options: Pet: 15,00 € / day One child under 2 years of age is free of charge per unit, with no claim to a bed or on board services. Tourist tax is included. Check in: 14:00 pm, Check out: 10:00 am. Prices are the total price for building / apartment on the day. Included are: utility fees in regular ratio of consumption (electricity, water, gas), weekly change of sheets and cleaning. For stays shorter than 4 days will be charged 30% add-on price. Registration is not included. Is 5 EUR per person (Single) Final cleaning not included in the price, an additional fee to be paid for final cleaning on departure from the accommodation. Located in a narrow bay on the southeast side of the island, a hill. Ivan. Tall houses, primarily around the port, and a number of luxurious villas with beautiful gardens, the main features of this lovely town, which with its 1000 inhabitants, the second largest settlement on the island.It is interesting to note that once Veli Losinj (Velo village) was higher than Mali Losinj (Little Village), but the Mali Lošinj historically developed faster, and today the situation is reversed, but the names remained to this day. In the narrow streets of Veli Losinj, through the 'gate' to see the luxurious villas of former captains, ship owners and wealthy gentlemen.The gardens of these villas were collected 80-dozen types of different plants, while in Veli Losinj park in front of today's spa, a former residence of Archduke Charles Stephen, has more than 200 botanical species. In the immediate vicinity of Veli Losinj is a small fishing harbor Rovenska, which attracts attention with its beautiful beaches, fishing atmosphere, the tradition of people who have dedicated their lives to the sea and direct contact with nature.